Swipe with Intention Workshop: Be the boss your dating life. Let's face it, dating can be a total bummer. You've probably felt: Frustrated with dating apps; overwhelmed by all the horror stories and rejection; and anxious that what you want isn't possible. The answer lies in swiping with intention. 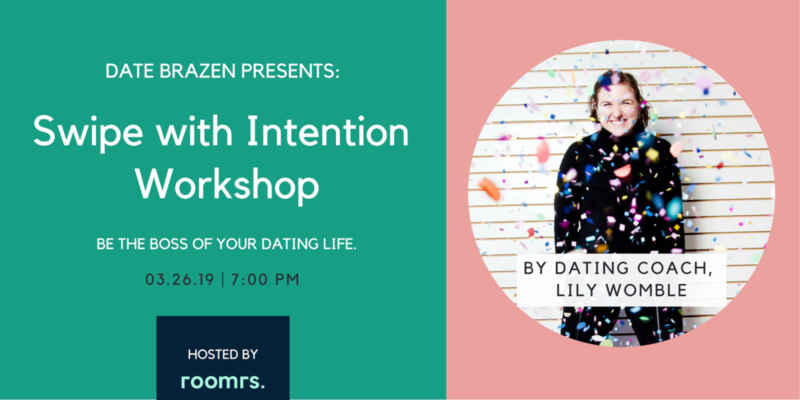 In this training, you'll learn the basics of Date Brazen's Swipe with Intention method, which will help you build a fulfilling dating life by becoming your own matchmaker. So, grab your bestie, join us for a glass of wine and invest in yourself with an evening of dating self-care. *All tickets include drinks, snacks and a complementary gift bag, filled with goodies from female founded companies in NYC. **This event welcomes all female identifying folks. ***Tickets aren't refundable, but fully transferrable. If you can't come, pass the love along to a friend! If you're frustrated with surface level dating apps, overwhelmed by all the dating horror stories and rejection, anxious that what you want isn't possible, then this Learnshop is for you. I'm Lily, and after setting up hundreds of dates as a matchmaker, I discovered the secret sauce my clients could use to become their own expert matchmaker. So I founded Date Brazen, a date coaching platform to help women build joyful, secure and fulfilling dating lives on their own terms. In this Learnshop, we'll dive into the concrete action steps necessary build a personalized dating strategy that actually works. I'm so excited to share this content with the amazing women in the Quilt community. I hope to see you there! In this training, you'll learn the basics of Brazen's Swipe with Intention method, which will help you build a fulfilling dating life, starting with finding the best dates for you in less time swiping.